Dancing in Blackness: A Memoir by Halifu Osumare, Ph.D. Dancing in Blackness is a professional female dancer’s personal journey over four decades, across three continents and 23 countries, and through defining moments in the story of black dance in America. In this memoir, Halifu Osumare reflects on what blackness and dance have meant to her life and international career. Osumare’s story begins in 1960s San Francisco amid the Black Arts Movement, black militancy, and hippie counterculture. It was there, she says, that she chose dance as her own revolutionary statement. Osumare describes her experiences as a young black dancer in Europe teaching “jazz ballet” and establishing her own dance company in Copenhagen. Moving to New York City, she danced with the Rod Rodgers Dance Company and took part in integrating the programs at the Lincoln Center. After doing dance fieldwork in Ghana, Osumare returned to California and helped develop Oakland’s black dance scene. 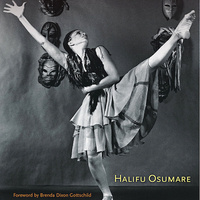 Osumare introduces readers to some of the major artistic movers and shakers she collaborated with throughout her career, including Katherine Dunham, Pearl Primus, Jean-Léon Destiné, Alvin Ailey, and Donald McKayle, as well as Oakland’s African diasporic that became the Malonga Casquelourd Center for the Arts. Now a black studies scholar, Osumare uses her extraordinary experiences to reveal the overlooked ways that dance has been a vital tool in the black struggle for recognition, justice, and self-empowerment. Her memoir is the inspiring story of an accomplished dance artist who has boldly developed and proclaimed her identity as a black woman. Halifu Osumare, professor emerita of African American and African Studies at the University of California, Davis, is the author of The Hiplife in Ghana: West African Indigenization of Hip-Hop.